Vidaai is the culminating moment when the bride leaves her parents and her home to start her new life post wedding. Also referred to as Bidaai, Vidaai is known as Rukhsath in Muslim weddings. In South Indian weddings, its known as Kschemadandulu. Vidaai takes place after the wedding rituals are completed. Vidaai is a very painful, emotional moment for the bride and her family. As the bride steps out of her house post wedding, she throws a handful of rice often mixed with coins and flowers, over her head three times. This way, she repays her parents for everything that she is today. Her parents and relatives standing behind, spread out their pallu or aanchal or jholli to receive the grains thrown by her. The bride is not supposed to look back, till she enters her doli. She anticipates prosperity in her new life through this gesture. She prays for her family’s happiness and prosperity as the flowers and coins symbolize them respectively. The bride’s father hands her over to the groom with a heavy heart requesting him to keep her happy forever, so that she doesn’t really miss her parents. The bride bids a sad farewell to her family. The couple is escorted by the bride’s father to the doli. The traditional doli is now replaced by the car. 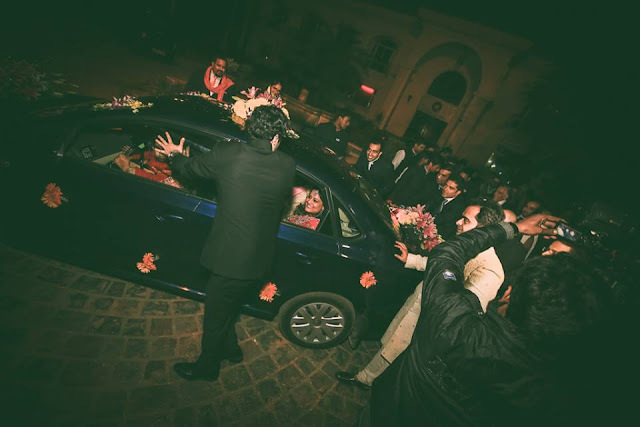 As the car starts, its pushed by the bride’s brother or cousins(if any). This is a symbol of helping her take her step to move ahead in her new life and wishing her loads of luck and happiness. Once the car moves, the bride’s family throws coins on the road. With this ritual, they complete their responsibility of marrying off their daughter. In addition, ward off evils and bad luck in her path, if any. Vidaai is an occasion or ritual full of mixed emotions. The happiness and content for the daughter to start her new phase of life with her partner and the pain of separation and distance, that she’ll no longer be a part of their family.